If you are unable to foster or adopt a Rescue Cairn, but you would still like to help, you can! Because many of you are not able to foster or adopt a Cairn rescue, but would really like to help us in our rescue program, we invite you to become a Foster Grandparent. It's really easy! You can sponsor one or more of our Rescue Cairns by providing a tax-deductible monthly donation until he or she is adopted into a loving "forever" home. Our Foster Grandparent Program will allow you to be an important part of that special dog's life by helping to provide the funds necessary for his or her medical care, food, treats, toys, and other essentials. Joining our Foster Grandparent program is also a wonderful gift to give to a family member or friend who loves dogs. What better way to honor them than to help save a Cairn in need? If you are donating to our program as a gift, please be sure to let us know and a "Gift Card" will be sent in your name. All donations, regardless of their amount, are gratefully accepted. However, in addition to the warm and fuzzy feelings that go along with helping a Cairn in need, for a minimum monthly donation of $25.00, we will send you a picture and periodic updates on the care, health, and welfare of your GrandCairn. Your name, as his or her "Foster Grandparent," will appear beside its picture on our website. Should you wish to remain anonymous, "Anonymous Grandparent" will be printed. Your monthly tax-deductible contribution can be made via PayPal or by check. If your generous donation exceeds the expenses of your GrandCairn prior to his or her adoption, we will share your generosity with one of our other Rescue Cairns in need. To become a Foster Grandparent, please complete and submit the form below. Every dog deserves a chance to live a healthy and happy life. However, sometimes the cost to restore a dog's health is enormous! You might be asking yourself, "What can I do to help?" 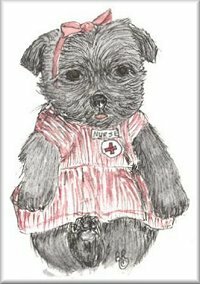 Col. Potter Cairn Rescue Network recognizes that not everyone can foster or adopt one of our "Special Needs" Cairn Rescues. Therefore, we have established a special, tax-deductible fund to help us provide medical care for specific Cairns whose history of neglect, abuse, injury, and/or severe illness would otherwise prove prohibitively expensive. CPCRN attempts to treat every dog in our rescue program with all the crucial medical care that they need and rightfully deserve. Because of limited funding and the exorbitant cost of the specialized care that some of our dogs require, this isn't always possible. Such medical bills can be devastatingly high. You can help us achieve our goal by becoming one of our very special "Guardian Angels." With your help, we can provide the medical care and assistance that some of our most medically compromised Cairns require. Will you help us help them? Here's how. Our Guardian Angel program will allow you to be an essential part of the joyous recovery of a Cairn who has touched your heart. By agreeing to donate all or a portion of the anticipated funds necessary to see a little one back to health, your tax-deductible donation will help us help them on their road to recovery! Once you have joined our Guardian Angel program, your name, as his or her "Guardian Angel," will appear beside its picture on our website. Should you wish to remain anonymous, "An Anonymous Angel" will appear instead. You may choose a specific Cairn to sponsor, or you may contribute as one of our "Archangels," where your funds will be used for any of our Cairns who are in most desperate need of medical care and assistance. Once we have reached our financial goal for a specific dog, the "Guardian Angel" designation will close -- so you can have the satisfaction of being the sole "Guardian Angel" for a needy little Cairn by donating the entire "goal" amount required to restore this little one's health! Funds donated to our "Guardian Angel" program are tax deductible, and will only be used for the "Angel" program: for dogs whose medical needs are extraordinary. If expenses are less than projected for a specific dog -- first we will celebrate, and then we will apply any remaining funds to other "Special Needs" dogs in our program's medical care. Please consider becoming a "Guardian Angel," or perhaps give this gift of life and health to a friend or loved one. What better way to honor someone than to restore a Cairn to health in his or her name? We will happily provide a gift card in your honor. Your tax-deductible contribution(s) can be made via PayPal or by check. Below are the Dogs in need of a Guardian Angel. The thermometer indicates how close we are to our goal. For updates on former featured dogs, see our Guardian Angel Stories page. To become a "Guardian Angel," please complete and submit the form below.